Many gram-negative bacteria are unaffected by Penicillin G because it cannot penetrate the envelope’s outer membrane. This is due to genetic mutations in bacteria that lead to changes in Penicillin-binding proteins present in bacteria. Mycobacterium species resist many drugs because of the high content of Mycolic acids in a complex lipid layer outside their peptidoglycan wall. This layer is impermeable to most water-soluble drugs such as Sulfonamide. Some pathogens have plasma membrane translocases, often called efflux pumps that expel drugs. Because these pumps are relatively non-specific and can pump many different drugs, these transport proteins are commonly known as multi-drug-resistance pumps. Such systems are present in E. coli, P. aerunginosa, and S. aureus. In Penicillin, the most crucial feature is the presence of the β-Lactam ring, which is essential for its bioactivity. Many penicillin-resistant bacteria produce penicillinase (also called β-Lactamase), an enzyme that inactivates the antibiotics by hydrolyzing bond in the β-Lactam ring. Drugs are also inactivated by three additions of chemical groups. For example, Chloramphenicol contains two hydroxyl groups that can be acetylated in a reaction catalyzed by the enzyme Chloramphenicol Acetyltransferase with Acetyl-CoA as the donor. Resistant bacteria may use any other alternative to bypass the sequence or step inhibited by the antibiotics. For example, some bacteria are resistant to Sulfonamide because they simply pick up the already formed folic acid from their surroundings rather than synthesizing it themselves. 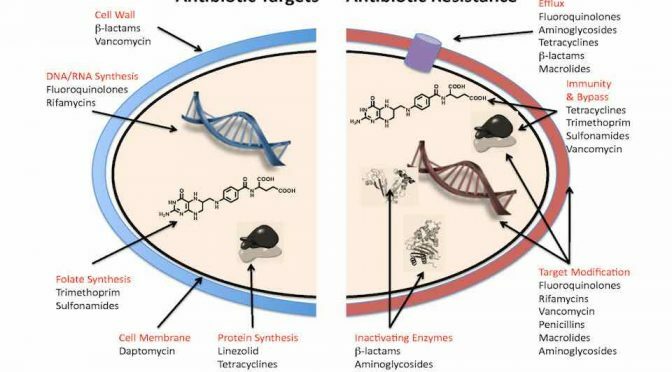 Antibiotic Resistance, if persists and increases then it will take our chemotherapeutic research twenty years back because all the antibiotics produced and discovered so far, will no longer of any use and we would enter a post-antibiotic era. Previous PostHow Diseases are Emerging and Re-Emerging?Next PostHow can we fight against Antibiotic Resistance? I have had Lyme disease for 25 years and I was sure I had it but the doctors would not treat me for Lyme disease because the only test given to me always resulted in an equivocal result. So I have been told that since I have had Lyme Disease for 25 years I have to be on antibiotic (all different one) for 25 years to cure me. I am not able to do this treatment any longer because the antibiotics I took for a about 3 or 4 or 5 months made me toxic. I was sick all over and I have no support system of people to assist me in life and I don’t want to do the treatment all alone. I want to know if you have any knowledge of Lyme Disease and how to treat it? Sorry, I won’t b able to help you as I am, not a medico. I am only a student of biotechnology and have studied life science previously. I was wondering if you know about treatment for Lyme disease because I have to take antibiotics for many many years and I do not have any support people who I can lean on while on the course of antibiotics. I get very sick from antibiotics. Thank you in advance for anything you can tell me . Sorry Susan, I will not suggest or prescribe you any kind of medications as I am not a doctor nor into the medicine stream. But, yes I can suggest you on the part of detoxification. As we know that antibiotics taken in such huge amount makes our body system toxic and we do not feel healthy. For this, first of all, leave all your junk food diet or any heavy foods such as non-vegetarian diet ( from heavy, I mean high protein, fat and carbohydrate content). Switch over to fruits, vegetables, fresh juices, lemons etc. These foods will help you in the detoxification process of your body. They will flush out all the unnecessary part of the medication that makes us unhealthy and makes our system toxic. It will seem silly for you but I would also suggest you for yoga and breathing exercises. They help a lot in complementing and supporting the detoxification processes. To defeat such a chronic disease, one needs to emotionally strong and determined to take on the disease. Thank you Vinod! I appreciate your positivity and your caring words are a delight to read. Course of 25 years on antibiotics is no picnic. The CDC reports Lyme disease infects 300,000 people each year. This is more than Hepatitis, HIV, Colon Cancer, and Breast Cancer. Lyme disease has the least amount of money for research. Hope you discover a cure for Lyme disease because it’s real and it’s an epidemic. yup! 25 years are more than enough and might be horrifying for you. Yeah! I have heard a lot about Lyme disease and it’s a huge crisis for public health especially in the United States. I am not very much familiar with the disease, Because, here in India, I never heard any cases of Lyme disease.